Judeo-Christian Westerners to understand, because it stands as the opposite of the myth of Adam and Eve in Paradise found in the Old Testament Bible. 5) most remarkably, this myth provides an explanation for one of the most puzzling motifs in the Biblical paradise story - the famous passage describing the fashioning of Eve, the mother of all living, from the rib of Adam. Why a rib instead of another organ to fashion the woman whose name Eve means according to the Bible, ‘she who makes live’? If we look at the Sumerian myth, we see that when Enki gets ill, cursed by Ninhursag, one of his body parts that start dying is the rib. The Sumerian word for rib is ‘ti’ . To heal each of Enki’s dying body parts, Ninhursag gives birth to eight goddesses. 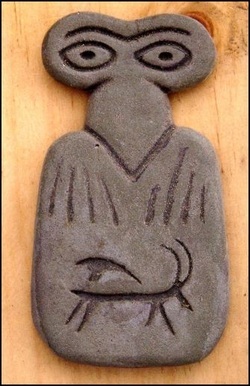 The goddess created for the healing of Enki’s rib is called ‘Nin-ti’, ‘the lady of the rib’. But the Sumerian word ‘ti’ also means ‘to make live’. The name ‘Nin-ti’ may therefore mean ‘the lady who makes live’ as well as ‘the lady of the rib’. Thus, a very ancient literary pun was carried over and perpetuated in the Bible, but without its original meaning, because the Hebrew word for ‘rib’ and that for ‘who makes live’ have nothing in common. Moreover, it is Ninhursag who gives her life essence to heal Enki, who is then reborn from her (Kramer, 1981:143-144). After Time had come into being and the holy seasons for growth and rest were finally known, Dilmun, the pure clean and bright land of the living, the garden of the Great Gods and Earthly paradise, located eastward in Eden, was the place where Ninhursag-Ki, the Earth Mother, Most Exalted Lady and Supreme Queen, could be found. There she lived for a season during the Wheel of the Year, when the Earth lay deep in slumber before the onset of Spring, in the land that knew neither sickness nor death or old age, where the raven uttered no cry, where lions and wolves killed not, and unknown were the sorrows of widowhood or the wailing of the sick. And it was in Dilmun, at that time that Enki, the wise god of Magic and the Sweet Waters, the Patron of Crafts and Skills, met, fell in love and lay with the Lady of the Stony Earth, Ninhursag-Ki. “For Dilmun, the land of my lady’s heart, I will create long waterways, rivers and canals, whereby water will flow to quench the thirst of all beings and bring abundance to all that lives” Enki then summoned Utu, the Sun God and Light of the Day. Together, they brought a mist from the depths of the earth and watered the whole face of the ground. Then Enki and Utu created waterways to surround the land with a never-ending source of fertile Sweet Waters, and Enki also devised basins and cisterns to store the waters for further needs. From these fertile sweet waters flow the four Great Rivers of the Ancient World, including the Tigris and the Euphrates. 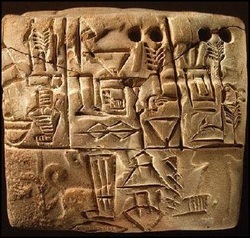 Thus, from that moment on, Dilmun was blessed by Enki with everlasting agricultural and trade superiority, for through its waterways and quays, fruits and grains were sold and exchanged by the people of Dilmun and beyond. Ninhursag laughed and welcomed the eagerness of the Sweet Waters Lord. Nine days later, the Great Goddess gave birth to a lovely girl without the slightest travail or pain. The girl was called Ninsar, Lady Verdure, the Mistress of Vegetation, the green carpet of grass, leaves and flower beds that cover the surface of the earth. As the Great Lady had declared, nine days later Ninsar was fully grown, charming and graceful, a sight to behold. Ninhursag then left for the Middleworld. Enki knew he would miss his beloved terribly, but while she was busy in the Middlearth giving her Essence for the land to grow happy and gay, equally busy was Enki in holy Dilmun. It was his sacred duty to oversee the rise and fall of all fertilizing waters that flowed from Dilmun to feed the rivers, lakes and ponds of the Middleworld to make the land ready to receive the Spring seeds. Thus, as much as he missed Ninhursag, Enki knew he could not leave Dilmun before all waterways were filled to ensure that the people would have plenty of water to grow their crops. Enki’s essence, the fertilizing power of the sweet waters, should reach every piece of land in the Middleworld that had been worked and ploughed. Middleworld that Enki saw Ninsar walking on her own along the marshlands. Indeed, a lovely goddess she had become, and Enki’s eyes fell on the Maiden’s. Deep within, the Sweet Waters Lord felt a longing he could not as yet define. He only knew that after Ninhursag’s departure, no other maiden had touched his heart the way this one did. Indeed, she who walked on her own along the marshlands was the closest version to Ninhursag his eyes had the luck to find. Enki did not lose time and immediately started wooing the young lady, encouraging her to love him wildly by the riverside. goddess of Green Fields and Luscious Meadows, yielded to the Sweet Waters Lord, and together they made wild love. But when morning came, Enki looked into Ninsar’s eyes and found her a loving, but pale portrait of Ninhursag. loveliness, at her cheerful smile and sweet face. Again, Enki saw in Ninkurra twice the mark of his beloved Ninhursag. Sadly, Ninsar realized that although she had been passionately loved by Enki for a time, there was a longing in his eyes, his body, soul and mind she could not satisfy. Thus, when Enki left her and young Ninkurra, Ninsar grieved deeply, but found hope, meaning and sustenance in drawing from her all-one-ness, her inner and outer resources to heal and grow with the experience. She also kept a watchful eye on Ninkurra, who, like herself, grew in record time. Lovely, resourceful Ninkurra demonstrated enormous energy by climbing the highest heights, up to the mountain tops, but also keeping her essence tied to the ground. This way Ninkurra, the Goddess of Mountain Pastures grew safe from all hatred or harm. delight, the well took the shape of a handsome god, who introduced himself to her as Enki the Sweet Waters Lord. Again, Enki looked at Ninkurra’s young and cheerful face, and desired to dive into the maiden’s embrace, for she reminded him twice of Ninhursag, the one and only to Enki’s wandering heart. The maiden at the mountain top though had attracted the Sweet Waters’ Lord. Had he again fallen in love? more experienced god. Thus she joyously yielded to him and love they made for nine days and nine nights. But Enki soon realized that as lovely as Ninkurra was, she could not be compared to Ninhursag. As before, the Sweet Waters Lord left Ninsar after nine days, when Ninkurra gave birth to another lovely girl-child called Uttu, the Spider, the Weaver of Patterns and Life Desires. “Daughter Uttu, beware of the marshes and the riverbanks, where Enki, the Sweet Waters god, reigns as Sovereign. There he will see you, there he will desire you and want to make of you his own, only to leave you all alone later on!”, was Ninhursag’s stern advice to Uttu. For a time young Uttu did follow the Great Lady’s advice and kept her distance from Enki’s lusty sight. But one day Enki’s desire won the young goddess’ heart, when he brought to her delicacies from the garden of delights: apples, cucumbers and grapes, all this and more Enki offered to the young goddess. Then Uttu, full of joy, opened herself to welcome Enki, the crafty god, and he embraced her with heartfelt glee, lying in her lap content and happy. Loving strokes, kisses and hugs they shared, until Enki’s seed found its way to Uttu’s young and yet untried womb. Waters Lord. With a tender kiss Enki took his leave, but did not say when he was going to come back, or ever returned to stay. Uttu swallowed stubborn tears, but decided not to surrender to loss and sorrow, and more. to do, would ensure the best course of action. 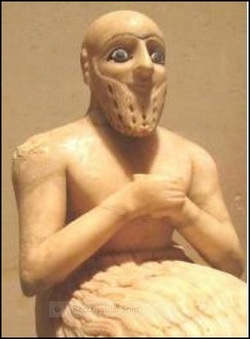 two-faced god Isimud, Enki’s vizier and friend. Both took long walks around the riverbanks, enjoyed the pleasures of the marshlands. Both saw the luscious plants. “What sorts of beings are those, Isimud, my faithful servant and friend? What is in them so new and yet so old that fills my heart with desire and my mind with deeprooted curiosity? I want to taste them, to know their hearts, I want to know their insides. What, pray, is this plant?”, Enki asked Isimud, pointing at the closest one. proceeded to cut down a piece of the treeplant and passed it on to Enki, who immediately ate it with greed. The taste of the tree-plant fuelled even more Enki’s desire to know the nature of the other seven plants left.. He asked Isimud about the nature of the seven plants, their essence and content. Enki got to know the hearts of the Plants World. his own, not only young maiden goddesses, but also the Plants World, angered Ninhursag beyond any measure. World. It is good to feel desire and experience the need to be one with the beloved. leave them afterwards, never to return. could not be found anywhere, while Enki’s health deteriorated little by little day after day. It soon came a time when Enlil left Enki’s side to sit on the dust, so immersed he was in despair and worry for the health of his younger and favorite brother. The Air Lord grieved for Enki. A world without the Lord of the Sweet Waters, Magic and Crafts, how sad it would be! Enlil simply could not conceive life without Enki’s cunning, humor and sheer energy. well-wishers. Their work was done. Ninhursag’s had just begun. “Dearest, what hurts you?” “O beloved, my whole body hurts me”, Enki managed to answer with visible effort. He moved into Ninhursag’s arms, for he wanted to see her face too. The Great Lady had closed her eyes, but there was a smile on her lips. She rested against the pillows of Enki’s bed, still holding him in a loose embrace. Now it was his turn to act with immense tenderness, as he shifted positions to make her rest on his chest. “You healed me by sending your soul into my body”, he said, deeply moved by the Gift of Life he had been given, and more. beforehand I wanted you for me only, and desired all maidens, because I knew not of the extent of my longing for you and only you. How impossibly stupid of me to think that I should find your image in every maiden I came across just to leave them when I realized they were not you!” They kissed passionately. say that from this strong and solid rock that means Life, Love and Fruition for me, the Waters of Life will flow forever in all worlds we dare to fare”. They kissed and hugged passionately, sealing their shared Fate forever, for as long as they wanted to be together. Ninhursag was his Soul-Companion, his Rock of Strength, the Inspirational Divine Feminine that brightened up his life. And if he could not have the last word with her, at least Enki knew very well how to quieten Ninhursag in the sweetest and wildest way for very long moments. With perfect skill and determination he started to kiss her holy body.